Paying fees was never this easy, last date to pay the fee and running low on time? No worries, Paytm is here to your rescue. Pay your school & college fees online at our site and get drool worthy cashback too. Don’t wait in long queues or stand for hours to deposit your school or college fees, instead PaytmKaro from the comfort of your home. Paytm aims at providing easy and quick solution to millions of students and their parents in India. We enables you to pay your school, institutes or college fees through online transaction which is easy, fast and secure. Pay your college, school, institution, tuition, medical college, engineering college, distance learning program’s or registration’s fees at our multi-utility online portal without the hassles of time consuming physical process of cash deposits. Use Promocode: PAYFEE. lucky Winner will win 100% cb every day. User can use only one Promocode at a time. Offer is valid from 1st July to 30th July’16. How to get Rs. 100 or Rs. 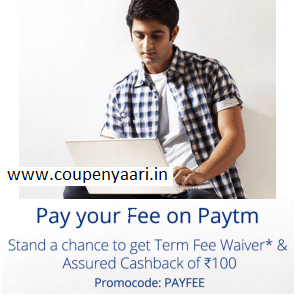 10000 cashback on Online Education Fee Payment of Rs.10000? 1 lucky Winner will win 100% cashback in Paytm Wallet upto Rs. 10000 every day. Pay your fee on Paytm. Participate in #YOUREDUCATIONISONUS Campaign and stand a chance to get a Term Fee Waiver! Now pay your tuition fee on Paytm and get 100% Cashback upto Rs. 10,000 in your Paytm Wallet. User needs to enter Promocode PAYFEE to avail the offer and to be eligible for the draw. 1 lucky Winner will be announced every day. Offer is applicable on minimum transaction of Rs. 10,000 & above. The lucky winner will receive a fee waiver for that respective fee cycle. The fees that are waived will be paid in the form of Paytm Cash. Once winners are announced, KYC process will need to be completed. Every winner will need to be KYC verified by Paytm before the Cashback can be transferred. Offer is valid for all the colleges and schools listed on Paytm.com across India. Paytm reserves the right to withdraw this Campaign at any time. Paytm reserves the right to disqualify any transaction from participation in this Campaign. Paytm employees and their relatives are not eligible to participate in this Campaign. Now pay your tuition fee on Paytm and get Rs. 100 Paytm Cash. User needs to enter Promocode PAYFEE to avail the offer. Offer is applicable on transactions done on both Paytm.com & Paytm App. Paytm Cash will be credited into user’s Paytm account within 24 working hours of the successful transaction. Cashback will be cancelled in case of refund or cancelled transactions. Mobile number needs to be verified to be eligible for the Cashback.